See the winners of the challenge! The new year is upon us, and it’s time to make a big push on the review queues! 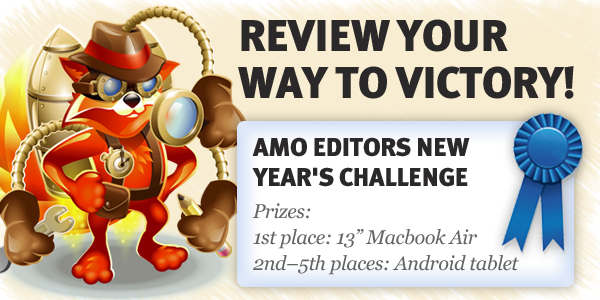 Between December 22, 2011 and February 22, 2012, AMO Editors are eligible to win some great prizes. All editors who complete 20 reviews or more during the contest period will receive Firefox t-shirts! Not an editor? If you are an add-on developer who’s interested in making an impact and enjoying some great perks, join us! No Mozilla employees or contractors are eligible. This is a volunteer-only contest. Qualifying reviews include only approvals and rejections for any of the three queues (nominations, updates and preliminary), and does not include the standard temporary rejection for add-ons with binary components. Reviews that need to be backed out due to editor mistakes do not count. Sounds like this contest will encourage quantity over quality, even with the final round that you’ve probably put in place to prevent this. Since we already have good guidelines of what an editor needs to do, quality is more of a requirement than a factor. We will be paying special attention to reviews done during this period, and add-on developers are usually very good pointing out when a review has a problem. Can anyone be an editor? (i.e. editors are those that review addons)? You can find the required profile for an editor on the wiki page. AMO Editors need to be experienced add-on developers, so that they are familiar with the code they need to review.